It's always nice to have good, efficient service and it is certainly appreciated. I particularly like the way you've communicated with this customer so promptly - take a bow! Use your remote control in remote locations with our IR Extending HDMI Splitter! This 4-way HDMI Splitter with IR Extenders is a reliable workhorse which supports most 1080p and 3D HDMI signals. A single input is fed by your choice of source device, and the splitter goes to work duplicating and boosting the video and audio data for distribution to as many as four displays (TVs, Monitors and Projectors are all supported). Being a powered unit with an Australian Mains adapter, you can enjoy HDMI cable runs up to 20 metres (in and out) with good quality HDMI cables. So far so standard, but this HDMI Splitter has a party piece in the form of a clever set of IR extenders. In cases where your hardware doesn't support CEC, this Splitter can bridge the gap between devices and send remote control signals back to the source - even if the device it's talking to is tucked away in another room or behind furniture. This system works for all four of the connected displays. In the above example, the remote control belongs to the source device (a Blu-ray Player), but can be used at the TV - no matter where its placed. The display(s) can be up to 20 metres away, or out of the line of sight of the player. The remote control signals are sent down through the HDMI cable, meaning you don't have to run any additional cables through walls - HDMI handles the lot without compromising your video or audio quality. This is achieved with a set of HDMI dongles which sit on the far end of the HDMI cable (away from the splitter). An attached receiver 'sees' the remote control IR codes, and sends them back to the transmitter attached to the splitter, which passes them on to your source device. By aiming the transmitter at the IR receiver on your Blu-ray player - as you would when operating the Blu-ray's remote - it receives the codes and performs the action. This system is good for most standard home theatre remote controls, but may not work with high frequency remotes like those from Foxtel. Operations are practically instantaneous, so it's just like you're in the room with the player. This system is equally capable in a home theatre, a conference room or even in a commercial setting where walking back and forth between the source device and display(s) just to operate the remote control and see if the right change has been made can waste a lot of time. 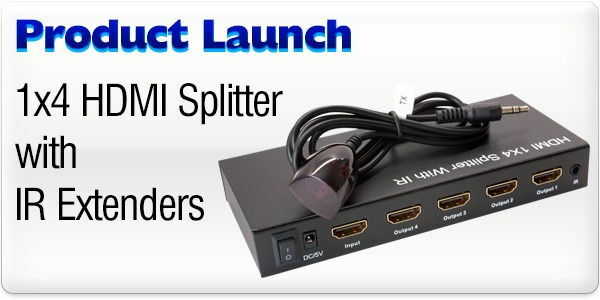 The splitter is HDMI v1.3b and HDCP 1.2 compliant, making it compatible with most standard media players (excluding Foxtel and Apple TV). You can also run DVI adapters after the HDMI dongles for video-only connections to single-link DVI displays like 1080p computer monitors if you choose to. Other than that, the splitter comes with the HDMI dongles, the IR transmitter and receivers, and of course a power cable. Simply connect up using your existing HDMI cables and you're good to go. Check out the full product page! Powered 4-Way HDMI Splitter with IR Extenders (HDMI v1.3b with HDCP) - includes FREE standard shipping Australia-wide!